Have you noticed that my social media is FULL of babies and maternity sessions lately? I absolutely love being a Houston Maternity Photographer and focusing on that first year with you and your baby! If you follow my blog, you might remember that I posted a “Stock the Studio” event to add some new maternity pieces to my client wardrobe! I scheduled most of these sessions for September and have been loving every second! Many of these mamas are also due around the same time I am which has been even more fun! This particular mama is a friend from a mom’s group that I absolutely loved! (Side Note: If you have a MomsClub in your area, check it out! They are so much fun!) Janet and I are both expecting baby number three AND we were also due weeks apart with our second babies! Isn’t it funny how that happens sometimes? It looks like our babies will probably be about a month apart again! She is another “team green” mama, but big sister is predicting a baby girl! Let’s face it. September in Houston is still incredibly hot. I’ve had plenty of mamas brave the heat (and humidity) outdoors, but it is also really nice to have an indoor option! There’s no sweat and no mosquitos! Major win in my book! When I updated the studio recently, I really wanted it to have a soft, neutral look. Some would call it a “light and airy” feel! I think the soft gray walls are the perfect neutral background for your maternity photos! I’ve said it here before, but Fillyboo Maternity makes the most beautiful dresses for expectant moms! The dress in this session is one their most popular, called the Fillyboo Wonder Years in Ivory. It has now been added to my studio wardrobe available to all of my clients. Fillyboo dresses are basically the things that photographer dreams are made out of! They are flattering and photograph beautifully. Each dress is made with details lace details or embroidery that are just incredible! They are definitely my top recommendation to moms! In fact, I bought the Fillyboo I Believe in Unicorns dress for my own maternity session! (More on that coming soon!) Also, these dresses were meant to be used by anyone, so feel free to borrow them for your family session as well! 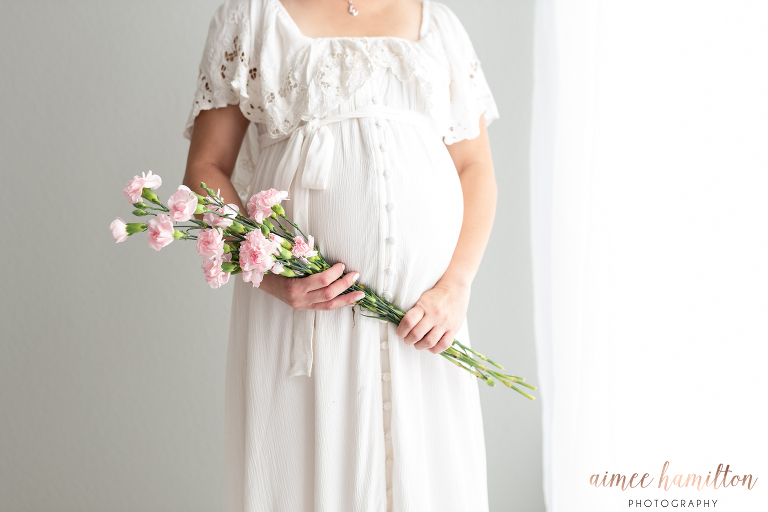 Aimee Hamilton is a Houston photographer with a specialization in capturing baby bumps through baby’s first year! For more information about booking a newborn package with a maternity session click here! If you are ready to book, let’s chat! I am currently booking spring 2019 newborn packages!